No other parking lot at the Sanford Sports complex has this sign, of course, the other lots are full of participants vehicles to. I wonder if this is what they meant by letting people from the public use their facility when they were begging for that $500,000.00 from the city’s taxpayers? Looks just like the drive-thru entrance at a White Castle. Well played, everyone. They need spaces for imaginary members. Some of this asphalt could be used for empty outdoor tennis courts. The problem is the ice plex has a TON of people using it. The parking lot is always full on a Saturday. Go out there and take pics and post them. I bet the ice plex folks are parking in the Match Pointe parking lot. Poor babies. They need to expand the ice plex parking anyway. Do it! We always build things slightly uncomfortably too small in this town. Go big or go home! Why doesn’t the Mothball Tennis Center folks buy 4 reserved parking signs for the three members of mayor’s family and the janitor who cleans up after them? They’d all have a place to park then. 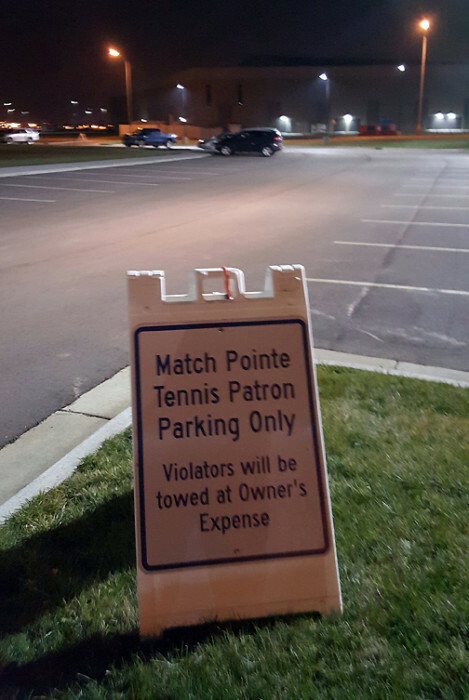 Actually – the iceplex expanded their parking this summer and they do not use the tennis parking lot, but if they did, there is obviously space. Just don’t get Darrin Smith (City Parking Director) involved. It’s cheaper to give away 150k of public money to a private club than to build another empty 3 million parking garage.